When a star tracker on NASA's Galileo spacecraft temporarily lost a star being used as a reference point for monitoring the spacecraft's attitude, engineers suspected an aberration in the equipment, not in the star. After all, this particular star is one of the 50 brightest in the sky, brighter than the North Star. And it wasn't listed -- at least not yet, when Galileo stopped recognizing it for about eight hours last June -- among the thousands of stars known to vary in brightness. 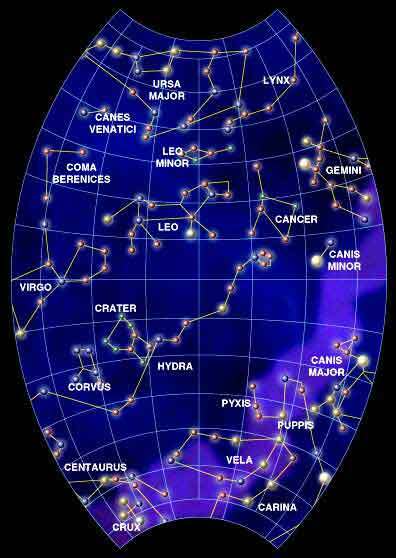 It is Delta Velorum, in the southern-hemisphere constellation Vela, the sail. "I spent about a week working on it, and concluded the star scanner wasn't broken, but perhaps the star was," said Paul Fieseler, an engineer for the Galileo project at NASA's Jet Propulsion Laboratory, Pasadena, Calif.
Galileo was never intended to make discoveries about distant stars while it orbits Jupiter, studying that planet and its surroundings. But combining information from the spacecraft's star tracker with careful observations by amateur astronomers in South America and Africa has led to a scientific report, published by the International Astronomical Union, that Delta Velorum does indeed vary in brightness. "Variable stars are common, but it's been a surprise that a star so bright could be variable without anybody reporting it before," said Fieseler. He co-authored the report with amateur astronomer Sebastian Otero of Buenos Aires, Argentina, and astronomer Christopher Lloyd of the Rutherford Appleton Laboratory in England. Fieseler wanted to figure out why the star tracker acted as if Delta Velorum had disappeared. The star is one of about 150 bright ones the tracker is programmed to recognize by their brightness and their position in relation to other bright stars. He quickly checked that Delta Velorum wasn't listed as a variable star, then tried to determine why the star scanner wasn't working right. "We were at a loss to understand what happened, but the problem didn't happen again, so we just went on to other things," said Fieseler. He did, however, send an e-mail to the American Association of Variable Star Observers, letting that network of amateur and professional astronomers know about the incident. He also found data from a few hours in November 1989 when the instrument measured a brief dip in the same star's brightness. Through various forwardings, Fieseler's message reached Otero, who likes to check the sky for errors and omissions in catalogues of stars' apparent brightness. Otero had noticed a one-night dimming of Delta Velorum in 1997, and had checked it frequently since then, observing it dim three additional times. He contacted Fieseler in October about his observations. "I had almost forgotten about the whole thing when I got this e-mail from Argentina," Fieseler said. Otero and Lloyd used the information from Galileo, as well as Otero's observations, to calculate the rhythm of the dimming events. They predicted the next two, at 45-day intervals. Several amateur astronomers in South America, Africa and Australia, watched Delta Velorum and confirmed the accuracy of the predictions. Delta Velorum was previously known to be a multiple star, a tight grouping of at least five stars. The pattern of dimming indicates that what had been seen as the brightest individual member of the group is actually two stars of similar brightness orbiting each other and periodically coming in front of each other, according to Otero, Fieseler and Lloyd. When either one eclipses the other, the total brightness declines by about 30 percent. Such mutually eclipsing binary stars are one of the common types of variable stars. Galileo's star tracker knew how to recognize Delta Velorum at its usual brightness, but when the brightness dipped, that dot of light no longer fit the programmed criteria, Fieseler said. If the instrument had not lost the star, Fieseler wouldn't have been looking for an explanation and Galileo would not have added a star's variability to its list of discoveries. Two factors may explain why nobody appears to have noticed this star's variability before Otero. The amount of change in brightness is small enough that it is difficult to gauge by eye, and the change happens only during a few hours every 45 days. More information about Galileo, which has been orbiting Jupiter since 1995, is available at http://galileo.jpl.nasa.gov . JPL, a division of the California Institute of Technology in Pasadena, manages the mission for NASA's Office of Space Science, Washington, D.C.